The week just isn’t complete without a pasta night. If you agree (and how could you not? ), you’re in luck! Our chefs put together a dish that’s sure to curb the most ferocious of carb cravings. 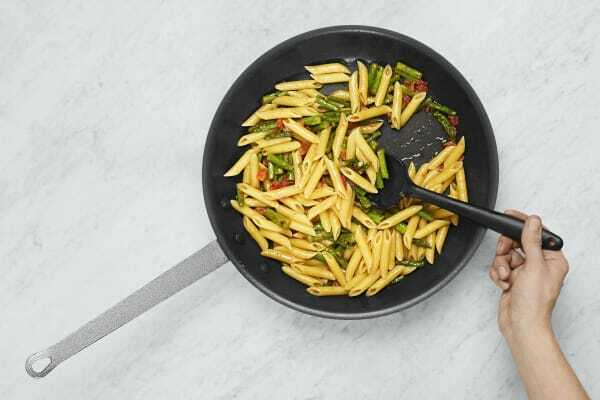 In it, you’ll find bites of penne studded with tender asparagus, fresh tomatoes, and swirled with garlic herb butter. 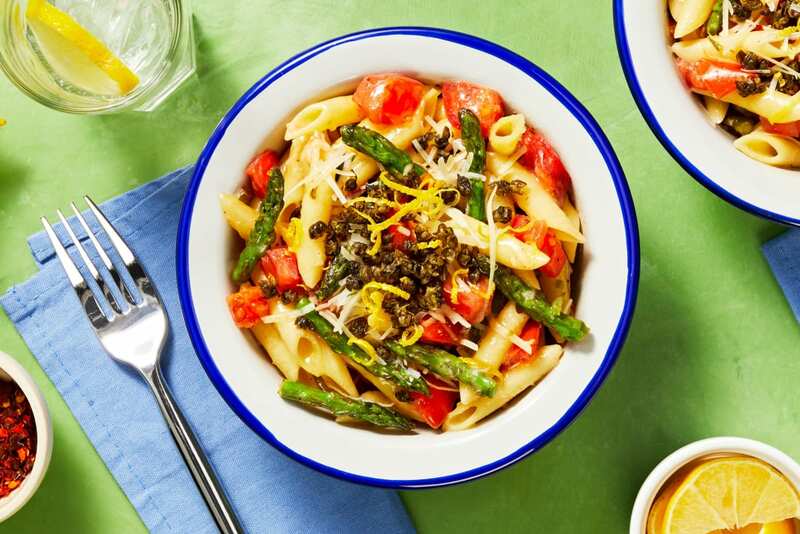 The dish is finished with a sprinkle of nutty Parmesan and your new secret culinary weapon: crispy capers. They’re crunchy, briny, and take just seconds to make. These buds really shine atop pasta, but add them to just about any dish for a crispy treat. Bring a large pot of salted water to a boil. 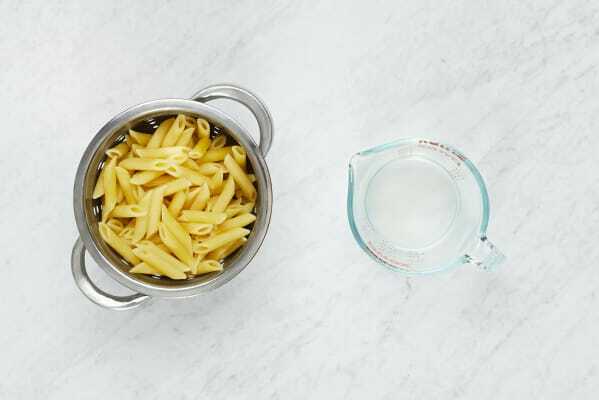 Once water is boiling, add penne and cook, stirring occasionally, until al dente, 10-12 minutes. Scoop out and reserve ½ cup pasta cooking water, then drain. Meanwhile, wash and dry all produce. Drain capers; thoroughly pat dry with paper towels. Trim off and discard woody ends from asparagus; cut crosswise into 1-inch pieces. Dice tomato. Zest 1 tsp zest from lemon; quarter lemon. Heat a large drizzle of oil in a large pan over medium-high heat. 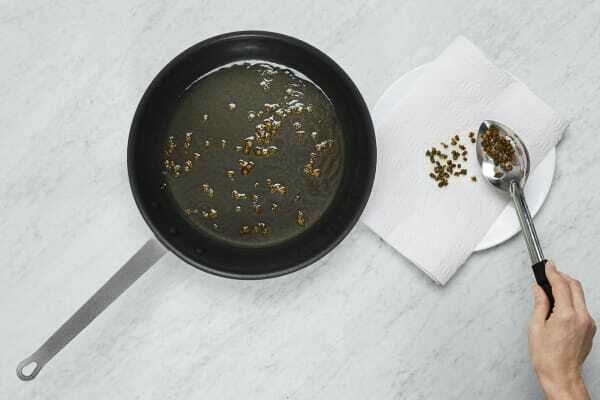 Once oil is hot enough that a caper sizzles immediately when added to the pan, add capers and cook, stirring occasionally, until crispy, 1-3 minutes. 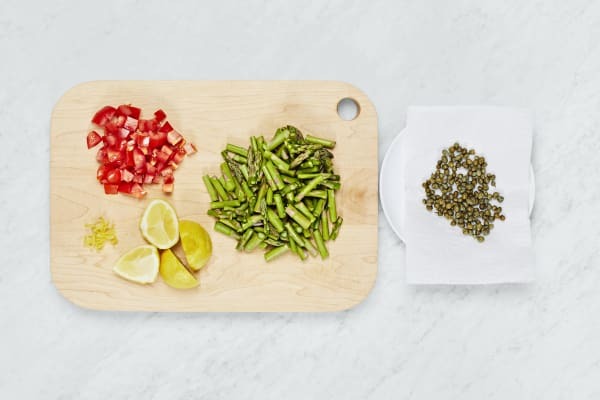 Carefully transfer capers to a paper-towel-lined plate. Heat a drizzle of oil in same pan over medium-high heat. 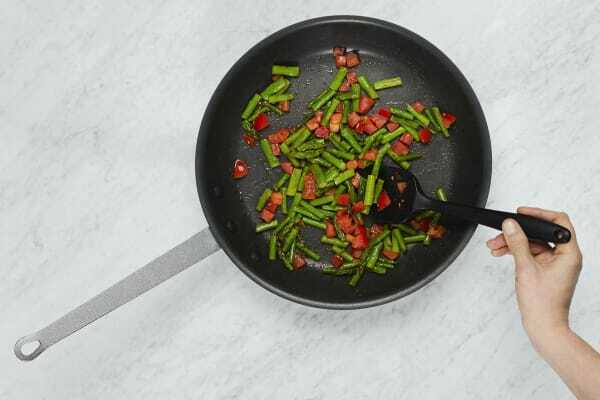 Add asparagus and a pinch of chili flakes. Cook, stirring often, until bright green, 2-4 minutes. Add tomato and cook, stirring, until slightly softened, 1-2 minutes. Season with salt and pepper. Add penne, garlic herb butter, half the Parmesan, and ⅓ cup reserved pasta cooking water to pan. Season with salt and pepper. Stir until thoroughly combined and a loose sauce has formed. (TIP: If sauce seems dry, stir in remaining cooking water a splash at a time.) Turn off heat; stir in a squeeze of lemon juice. Divide pasta between bowls. 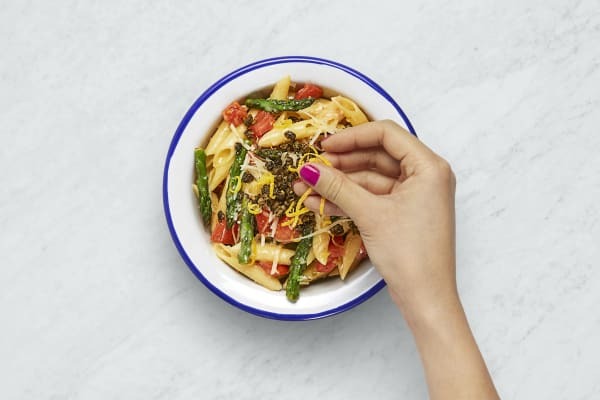 Sprinkle with remaining Parmesan, a drizzle of olive oil and as many crispy capers as you like (you may have capers leftover). Garnish with lemon zest and additional chili flakes (to taste). Serve with remaining lemon wedges on the side for squeezing over.